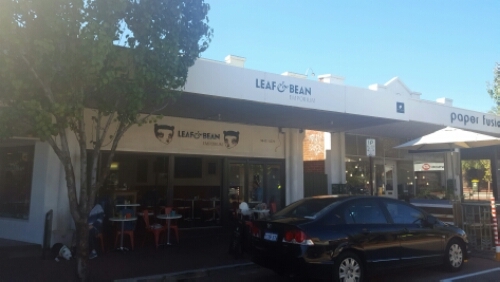 Since moving away from the Stirling area, I have found myself exploring a little more and today’s adventure takes us to Leaf & Bean in Mount Hawthorn. Up until recently, Mount Hawthorn was a little unexplored with my first visit to Casa Bianchi. Leaf & Bean is quite a different venue. On our visit, there were many customers in for take away coffees and lunches but the we were amongst many who were able to take our time and enjoy our brunch date on site. Parking is pretty simple, we were lucky enough to grab a spot out on the street. There is a large communal table in the centre of the café where a few lone customers were enjoying their coffees in take away cups while flicking through the paper. We took a seat close to the serving counter and noticed a lot of fresh items in a display fridge. There was no greeting, no menus on the table or anyone who brought the menus down to our table so off I went in search of one myself. I had a quick look in the display fridge on my way back and a quiche or pre-made sandwich didn’t tickle my fancy so I went for something more along the lines of my usual choice. We had a quick look over the menu and made our choices. To order, you must go up to the counter, I found the service a little rude, as if I was inconveniencing the girl behind the till by ordering food. Anywho, I will give you two guesses what I ordered! If one of those guesses was a Potato Rosti ($17) you guessed right. Mr. T went for something he has not ordered in a while, a Breakfast Wrap. 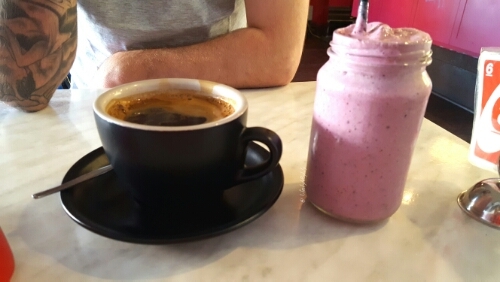 We kept it pretty simple in regards to drinks, I ordered my usual Long Black ($3.90) and Mr. T ordered a Berry Smoothie ($6.60). My coffee was slammed on the table enough to tip a little over the edges and Mr. T received his smoothie. Regardless, I enjoyed the coffee blend. It was nicely roasted and quite smooth, exactly what I was after. Mr. T said his smoothie was tasty and not too icy. Food! I really enjoyed my Potato Rosti and the presentation was neat. It was a rather small dish but it was extremely tasty! The spinach was fresh and topped with an extremely generous portion of fresh salmon. The last part of the dish was the poached egg perched on top of the dish and it oozed a runny yolk as soon as I pierced it. Had the potato hash been a little bigger and another egg on top, it would have been perfect. Nevertheless, I enjoyed it and would order it again. Mr. T found his wrap very easy to eat as it was well rolled. With all of the ingredients on the dish, the wrap was not soggy, nor was it overfilled. 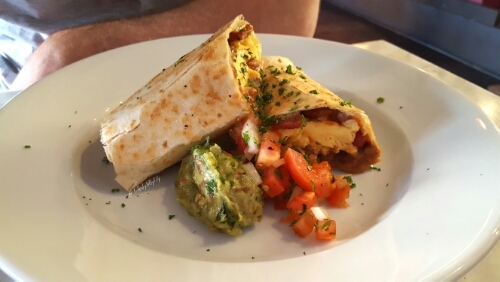 There was a tasty chorizo all the way through the wrap adding texture, taste and saltiness. The guacamole was on the side and Mr. T spread it inside his wrap, after I had tasted it of course. The chopped tomato was a little lost in the dish unless it was inside the wrap, however, if the tomato was inside the wrap, it might make it soggy and who wants to eat a soggy wrap. Mr. T had no complaints about his dish at all and really enjoyed it. 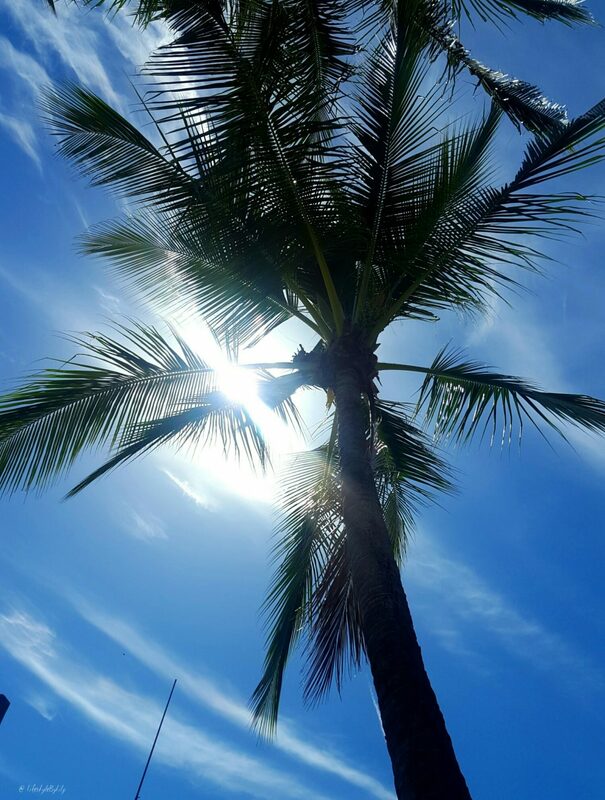 For the location and the food, I would definitely return. I hope we caught the service on a bad day but I guess I will just have to find that out for myself. Also in the area is Casa Bianchi for an Italian breakfast in a Thai inspired venue. Where is your favourite place for a Potato Hash?